Haplogroup W is particularly common in the eastern half of Europe, in the North Caucasus, in Central Asia, in Iran and in the north-west of the Indian subcontinent. In Europe, the maximum frequencies of W are observed in Finland (9.5%), Hungary (5%), Latvia (4%), Macedonia (4%) and Belarus (3.5%, but over 5% if we exclude the south). Haplogroup W is also well represented among some ethnicities of the North Caucasus, such as the Karachay-Balkars (8%), Avars (8%), Svans (8%) and Adyghe-Kabardin (5%). In Asia, haplogroup W is most common among the northern Pakistani (8%), Tajiks (6%), northwest Indians (5%) and Iranians (3.5%), but is also found around 1.5% among the Uzbeks, Turkmens and Kazakhs, and at trace frequencies (< 0.5%) among many North Asian ethnic groups (Tuva, Yakuts, Buryats, Mongolians, Koreans, Japanese). 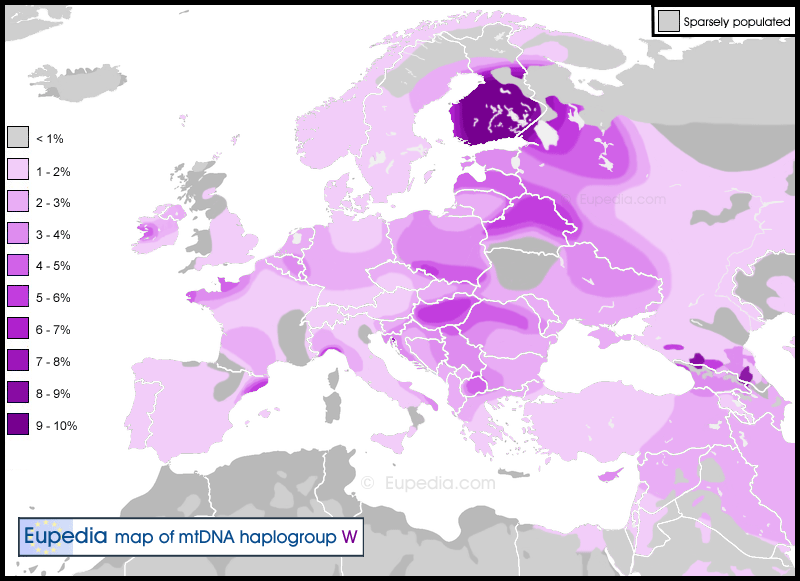 Haplogroup W is descended from haplogroup N2. It is defined by 11 new mutation thought to have arisen during the Late Glacial period, probably somewhere around the Caspian Sea some time between 16,000 and 20,000 years ago. The oldest branch to develop was W1, which emerged about 15,000 years ago, followed by W3 and W6. The mutations for W4, W5 and W7 might be as recent as 9,000 or 10,000 years before present. The geographic distribution of haplogroup W suggests at a strong correlation with the historical population movements of Y-haplogroup R1a, the Balto-Slavic and Indo-Iranian branch of the Indo-European speakers. Haplogroup W has never been found in ancient DNA samples in Europe before the Neolithic. The oldest known sample is a W1 (with the T119C mutation) from the Early Neolithic (6500-6200 BCE) in north-western Anatolia (tested by Mathieson et al. (2015)). Neverleless, W1 doesn't seem to have entered Europe with Early Neolithic farmers. Its presence remained rare throughout the Neolithic period in Europe, limited to isolated samples from the Late Neolithic or Chalcolithic (two W1c from East Germany dating from c. 4000 BCE and one W1 from Catalonia from c. 3250 BCE), and restricted to the W1 subclade. There are several explanations for the presence of these W1 lineages in central and western Europe before the Indo-European migrations from the Pontic Steppe during the Bronze Age. They may be remnant of isolated Mesolithic tribes of hunter-gatherers from eastern Europe (R1a or R1b lineages) who ended up in western Europe, as indicated by the very low presence of very old subclades of R1a (CTS4385) and R1b (P25) in western Europe. They might also have been picked up by Neolithic farmers in the Carpathians through populations exchanges with steppe people, then spread westward with the the Linear Pottery culture (LBK) to Germany. The Bronze Age marks the arrival of most W subclades in Europe, starting with the Corded Ware culture (2900-2400 BCE) in central and northern Europe, who is associated with Y-haplogroup R1a. Ancient samples identified from this period include W5a and W6 from Germany. One W3a1 sample appears a few centuries later in the Unetice culture, also in Germany. Mitonchondrial DNA samples from the Yamna culture, the presumed homeland of Proto-Indo-European speakers, yielded one W3a1a, one W6c (Haak 2015)) and another W6 (Wilde 2014)), all from the Middle Volga region - an indubitable evidence that haplogroup W was indeed found among the original Proto-Indo-Europeans. The expansion of Proto-Indo-European tribes propagated W subclades in opposite directions from the Pontic-Caspian Steppe, a western branch colonising Central Europe and the Baltic region, while the eastern branch expanded over Central Asia, settling particularly in the historical region of Bactria ( northern Afghanistan, eastern Uzkbekistan, Tajikistan and Kyrgyzstan), then invaded the Indian subcontinent, Iran and the Near East. Many W subclades show just that geographical dispersion, including W1c, W1g, W3, W4 and W6. In India, haplogroup W is considerably more common among the upper castes and among Indo-European speakers according to Metspalu et al. (2004). W5 is mostly found in Germanic countries, with a weaker presence in Poland, Baltic countries and Finland. Its distribution would correspond to the Corded Ware expansion (R1a-Z283 branch), and it was indeed found in a sample from that period in Germany. The W1a and W1b subclades are typically found in Finland, where they may have been introduced by the Corded Ware expansion as well. The high frequency of W1 observed in Finland today would have resulted from a founder effect in the Corded Ware settlers. Blond hair is thought to have originated within the R1a branch of the Indo-Europeans, and would have been propagated by women belonging to haplogroup W, among others. The absence of haplogroup W among the Basques, the Sardinians and Maghrebians correspond to the absence of Y-haplogroup R1a and of Northeast European admixture in these populations. W1c: found in the British Isles, Scandinavia, Germany, Poland, Greece, Turkey, Georgia, Iran (Persians), Uzbekistan, Tajikistan, Pakistan and India. The A10398G mutation found in all members of haplogroups W1e1a and W3a1d has been associated with increased longevity (Dato et al. (2005), Shlush et al. (2008) and Nijiati et al. (2013)) and protection against PD (Ghezzi et al. (2005) and Clark et al. (2011)). The common C150T mutation has been found at strikingly higher frequency among Chinese and Italian centenarians and may be advantageous for longevity and resistance to stress according to Chen et al. (2012). C150T defines haplogroups W5a2, but may also be found occasionally among other subclades. Hendrickson et al. (2008) studied the role played by mitochondrial function in AIDS progression in HIV-1 infected persons. They found that AIDS progression was slower for members of haplogroup W.
A study conducted by Maruszak et al. (2014) analysed the mtDNA of 395 elite Polish athletes (213 endurance athletes and 182 power athletes) and 413 sedentary controls and found that haplogroup W is among the most overrepresented mtDNA types among power athletes at the Olympic/World Class level. Haplogroup W5a in particular carries the 16362C mutation, one of the two polymorphisms associated in this study with achieving the elite performance level. Another study by Murakami et al. (2002) associated the same 16362C polymorphism and 16223T (found in all members of haplogroup W) with higher training responsiveness. Three other polymorphisms were associated with increased VO2max, including 199C, which defines the W3a1c, W3a1d and W3b clades. Martha Stewart (b. 1941) is an American businesswoman, writer, and television personality. She has written numerous bestselling books, is the publisher of the Martha Stewart Living magazine, and hosted two long-running syndicated television shows, Martha, which ran from 2005 to 2012, and Martha Stewart Living, which ran from 1993 to 2005. Her haplogroup was disclosed as being W6 by the PBS TV series Finding Your Roots. She was born Martha Helen Kostyra and is of Polish decsent.